Preventing tonsil stones is important if you don't want bad breath or discomfort in throat. Home remedies like gargling and brushing often work. It is common to have stones in your kidneys. But, do you know you can have stones in your tonsils as well? It may come as a surprise to many but the tonsils are a common location where hard and often painful stones may develop over time. Knowing what causes tonsil stones will help you understand how to prevent tonsil stones from forming in the first place. You may not notice any symptoms at all, especially when the stones are small. The most common symptom is to cough up soft, small, and smelly lumps. Other symptoms include throat closing, choking, coughing fits, and a metallic taste. If stones become large, they may cause symptoms like tonsil swelling, bad breath, white particles, sore throat, difficulty swallowing, bad tastes, and a 'foreign body sensation' in the back of your throat. To be able to prevent tonsil stones, it is important to get familiar with what causes these stones. Your tonsils may provide safe spaces for bacteria and other materials such as mucous and dead cells to accumulate and form white lumps that usually occur in the pockets. Tonsilloliths or tonsil stone in general usually affects people with chronic inflammation in their tonsils. Even in that case, the stones are usually small in size and don't pose many problems. You can prevent tonsil stones by making small changes to your daily routine. Simply by practicing good oral hygiene and healthy diet habits, you will be able to reduce your chances of developing tonsil stones. One of the ways to prevent tonsil stones is to brush your teeth regularly. Brushing will help get rid of any debris that may calcify in your mouth. It is equally beneficial to floss your teeth at least twice a day to remove mucus, dead cells, and food particles from your mouth. Brushing also helps because it removes plaque that contains anaerobic bacteria, an integral part of tonsil stones. Your tongue can accumulate bacteria, food particles, and other materials in papillae, the tiny pockets on your tongue. Be sure to scrape your tongue regularly to prevent buildup of unwanted materials that lead to tonsil stones. Doing this will remove bacteria that may cause a tonsillitis episode. Gargling will help improve your oral hygiene and prevent tonsil stones. It is even better to mix a tablespoon of salt in warm water to gargle after every meal to remove mucus, food particles, bacteria, and other harmful materials. One of the most important ways to learn how to prevent tonsil stones is to drink water regularly. If you don't keep your mouth from going dry, this will provide bacteria a nourishing environment to grow out of control. Drinking plenty of water is beneficial even if you have already formed tonsil stones. Water will help bring those stones out of the crypts. It is equally important to learn what not to drink or eat. 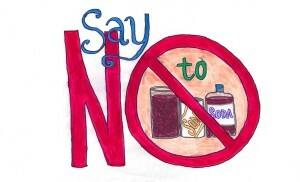 You should consider eliminating carbonated drinks from your diet. They will always contribute to the formation of stones and lead to other complications as well. It is equally important to limit or eliminate alcohol from your daily life because it will dry up your mouth and even cause bad breath. Smoking may also cause tonsil stones, so avoid it. You should also limit certain foods such as dairy products, including cream, milk, and cheese because they contain calcium and form stones in the tonsil. Instead of removing your tonsils, you may consider removing the stones only. It is possible to dislodge them with a clean finger – you can also use a cotton swab for this purpose. It is important to keep in mind that your tonsils are quite delicate, so you really don't want to go hard on them. Your doctor may also help you remove large tonsil stones manually. You can also opt for a laser treatment to get rid of your tonsil stones. The procedure involves getting rid of the crypts where these stones lodge. You will be under local anesthesia during the procedure, but you won't experience much discomfort. The recovery time is not much as well. It is possible to prevent tonsil stones by removing the tonsils surgically through a procedure called tonsillectomy. It involves eliminating the tissues of the tonsils completely, but is usually a treatment option in severe cases when other treatments don't produce desired results. Can You Take Alcohol with Melatonin?